Long sleek speedsters of the early automotive days are always a sight to see. This 1927 or 1928 Packard Speedster is missing some of its pieces, but what remains isn’t too shabby. The engine last ran 15 years ago, and there seems to be enough remaining for someone ambitious enough to take on this project. With only 2 days remaining, bidding has only reached $900.00! Find it here on ebay out of Stockton, New Jersey. If this is in fact a Speedster, then you are looking at a 384 cubic inch inline 6 that develops a whopping 120 horsepower. The engine has a fair dusting of surface rust, but overall isn’t eaten up or pitted from extreme neglect. The engine did run 15 years ago, but there is no mention as to the condition of the engine as of now. The drivetrain is “complete” from head to toe, meaning to me, that someone needs to save this! Beyond the complete drivetrain there is no cockpit, and the beautiful and mesmerizing boat tail is missing as well. Thankfully the frame looks solid with no thin or rotted areas visible. The front of the cockpit, firewall, engine covers, and radiator are present, meaning all the future owner would have to do is “come up” with the rest of the missing panels. Nothing would make me happier than to see someone do something with this car. Perhaps an ambitious project, but certainly one that would take your breath away once completed. 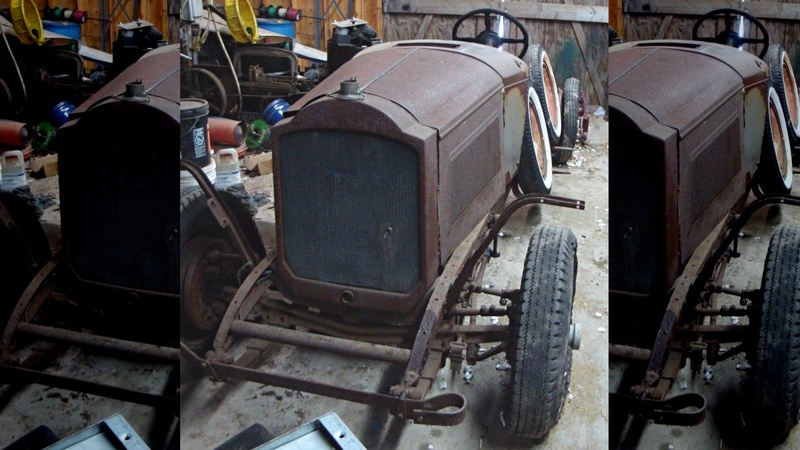 With 2 days remaining in the auction, what do you think this Packard will sell for? If not seized (most likely not), worth the price of admission for the engine alone. Add in the grill, radiator, hood, dash, frame, etc, and it’s quite a deal if you are a Packard guy. A double negative……..does that mean it is likely frozen? 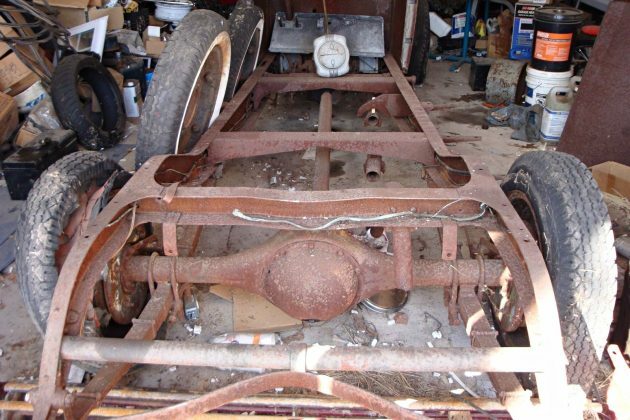 Packard is a short wheelbase, 133 inch. 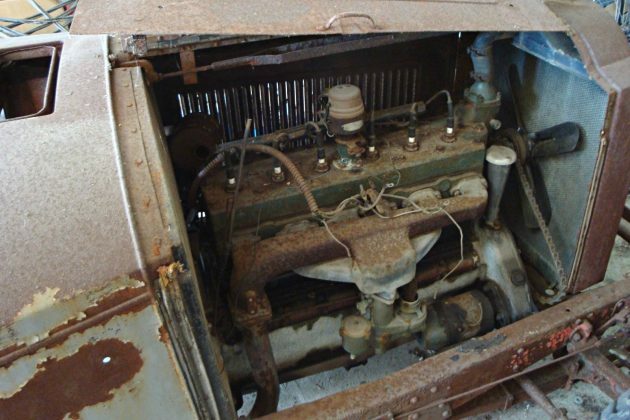 ENGINE: A Packard straight 8 is 384.8 cu in; it produces 85 hp. So I suspect this 6 cylinder is a smaller displacement and less than 85 hp. No, 1921-1928 they offered in line sixes (next to their 8 cylinder brothers) and from 1937-1947 they offered straight sixes as well. Someone should call the EPA on that guy. look at all those waste oil and chemical containers lying all over the place is a fire hazard. Why the epa? They arent leaking. The fire marshal if anything. Why at all? are you the container police??? How do you know they are oil and chemical? Isn’t it his private property, how do you know where the building is, what it is constructed of, the proximity to other structures. Comments like that are killing car collecting and restoration and make it so people won’t let you on their property, let alone invite you into their barn to take photos. Whoa, calm down there tiger. I hardly think a comment on barn finds meant as a little joke is going to “kill car collecting and restoration”.. did you forget to take your medication again, Jay? Speedsters were introduced in 1929 and were all 8 cyl om a short chassis. They were and are the holy grail of Packards. So this is not a speedster.